The ranking of top business schools and top MBA programs ranks by the QS Global, around the world. It is based on different criteria such as entrepreneurship, employability, return on investment, alumni outcomes, diversity and thought leadership. Harvard business school in Boston, Massachusetts, USA is one of highest ranked MBA schools in the world in 2018. This business school offers full-time MBA programs. Harvard University was established in 1908 and known as the MBA originator. It ranks on the top of the universities in employ ability, alumni outcomes and for entrepreneurship. The aim of the business school is offering higher study in the humanities field. At the second MBA college in the ranking of QS Global is INSEAD. It is the first institution in Europe to offer top MBA programs. It was established in 1957, and the motto of this school is “the business school for the world.” INSEAD was also the 1st institution of business to provide an MBA course for one-year. It ranks in the third number for alumni outcomes and entrepreneurship. This institute offers a full-time EMBA, MBA, Finance programme’s master and other various executive education business programmes. HEC Paris is one of the top MBA colleges in the world; it ranks third in the world and second in French institutions. This famous business school was established in 1881. It is located in Jouy-en-Josas, France. The motto is “Apprendre à oser.” It ranks first for diversity because of international students that are 92% according to the reports. HEC offers EMBA, MBA, and master in management programs. The Stanford is one of the most selective business school in the USA and ranks fourth in the world. It is also known as the Stanford GSB and was established in 1925. This famous business school offers MBA, the MSx programs and joint degrees such as Education, Earth Sciences, Law, Medicine, and Engineering. The institution comes at 1st in entrepreneurship and 10th for leadership programs in the world, according to the ranking criteria. London Business School ranks first in Europe from 2014 to 2017, according to the Financial Times. It ranks 3rd in employability, 4th for alumni outcomes and entrepreneurship in 2018. It was established in 1964 in London, UK. The motto of this famous business college is “To have a profound impact on the way the world does business.” It ranks 12th for the international students’ diversity. The Wharton School of the University of Pennsylvania is the world’s oldest business school, founded in 1881. The motto of this one of the top business school is “knowledge of action.” It provides top MBA programs and also famous for producing the most of the billionaires in the USA. This renowned business school ranks 4th for employability and also ranks for alumni outcomes, thought leadership, and entrepreneurship in the top ten. The MIT Sloan School of Management is located in Cambridge, USA. It is a business school of Massachusetts Institute of Technology. It is also known as an MIT Sloan or Sloan and established in 1914. This famous institute ranks seventh in the global ranking. It ranks in the top ten for its entrepreneurship, alumni outcomes, thought leadership, and employ-ability. Sloan provides bachelor degrees, master degrees, and executive education. 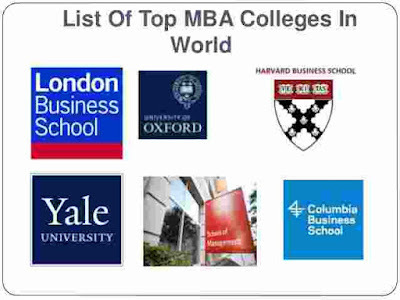 Columbia Business School also comes in the top MBA colleges in the world. It was established in 1916 and located in New York City. It is the only Ivy business school in New York and ranks 8th in the global ranking system. It also ranks in the top ten in employ ability and entrepreneurship. In the MBA programs, it has 16% admission rate in 2017. It also ranks in the diversity; students come from various countries for study in this famous business school. The next business school in the ranking is Saïd Business School, University of Oxford. It was established in 1996 and located in Oxford, United Kingdom. Per year, it enrolls 320 students approx. This college provides full-time MBA degree for one year. This institute ranks 2nd for the thought leadership and 11th for diversity in the world. IE Business School is ranked in top 10 MBA colleges, located in Spain. This prestigious business school established in 1973. It is famous for offering top MBA programs. It offers Finance and management programs, executive MBA and executive education programs. It ranks in top ten for entrepreneurship, alumni outcomes, and diversity.